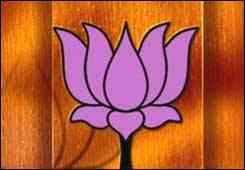 Bangalore,May 16, 2008: The Bharatiya Janata Party has modified its strategy for the campaign in the final phase of polling by making “political stability” its main poll plank. Though political stability was one of the key issues in the party’s agenda for the first two phases of polling, it is going to be the main issue in the third phase. Such a decision is said to have been taken as the third phase of election, in the light of the exit poll surveys, would not only decide the winners but also decide whether there will be a hung Assembly. The exit polls have indicated that the BJP’s performance has been a shade better than its rivals and consequently, the BJP is keen on putting in a good performance in the third phase as well. According to sources, terrorism would be the second main issue as Hubli, which witnessed a bomb blast, and Belgaum, from where a suspected terrorist was arrested, go to the polls in the last phase. Party General Secretary and spokesperson Suresh Kumar told The Hindu that the theme for the final phase was “the BJP is the only answer for political stability”.